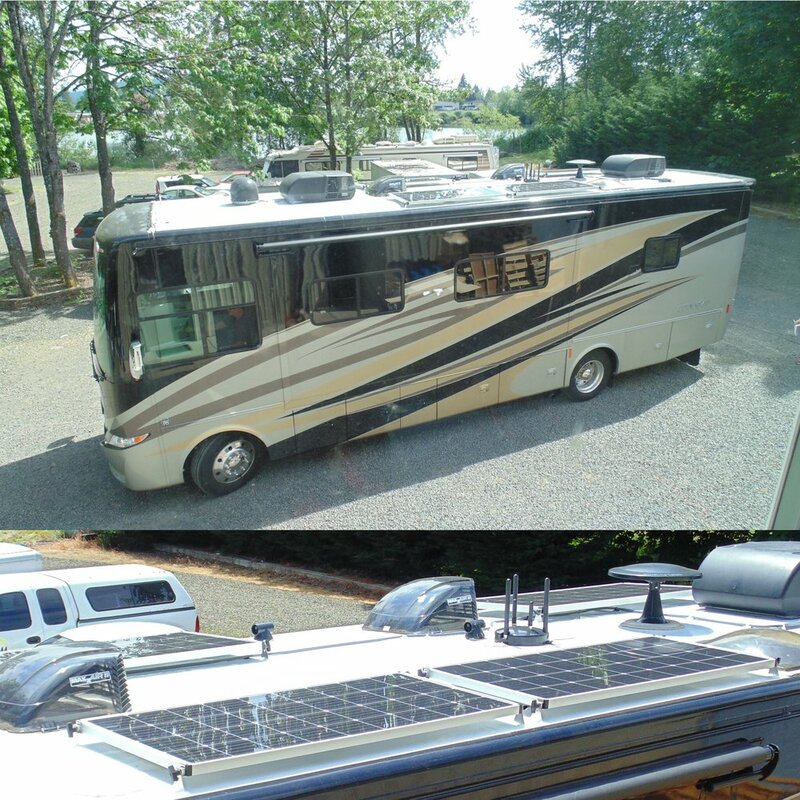 We installed a Blue Sky system for this client several years ago, and they recently came back to have a new solar power system installed in their new coach. Their primary need for a solar power system is to offset the energy used by their residential refrigerator. 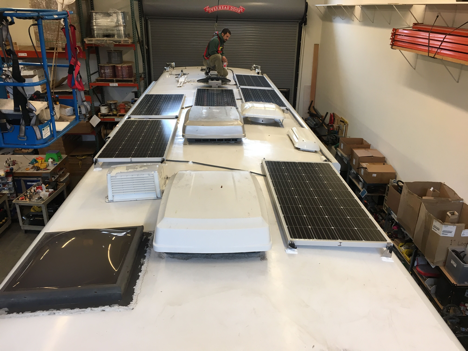 We installed 680W of solar power on their roof, about three-fourths of which will go towards powering their refrigerator. In ideal conditions (lots of sun) the excess solar power can be used to charge their batteries faster. Sometimes conditions are less than ideal though (not enough sun), which is why no one complains about having too much solar power. This client’s rig came to us equipped with both a residential fridge, and an AC/DC freezer. 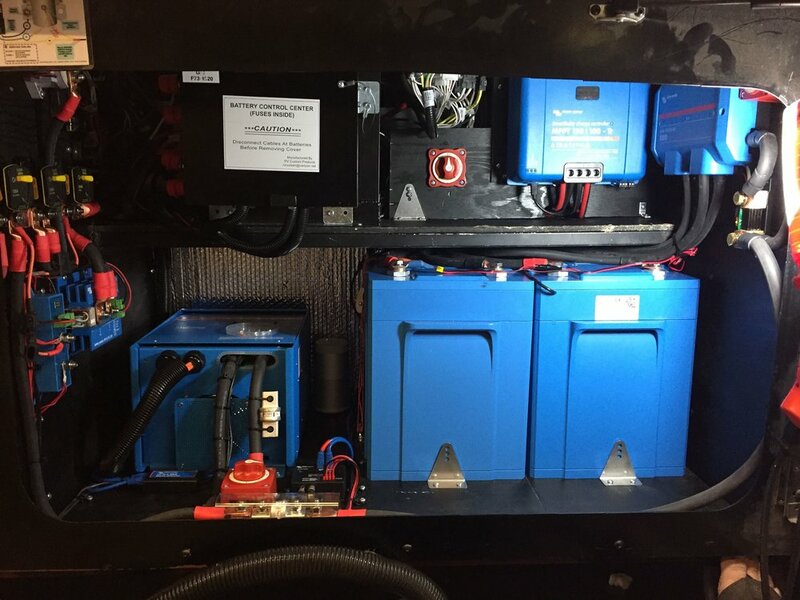 They also had a 3000W Xantrex inverter (previously installed), and a battery bank consisting of eight 6V Discover AGM batteries providing 414Ah of usable battery capacity. We installed 1400W of solar power on their roof, mixing five SF180W solar power kits with 5 SP100W solar power kits. On average, the solar power generated by this system will restore about 350Ah a day to their batteries. 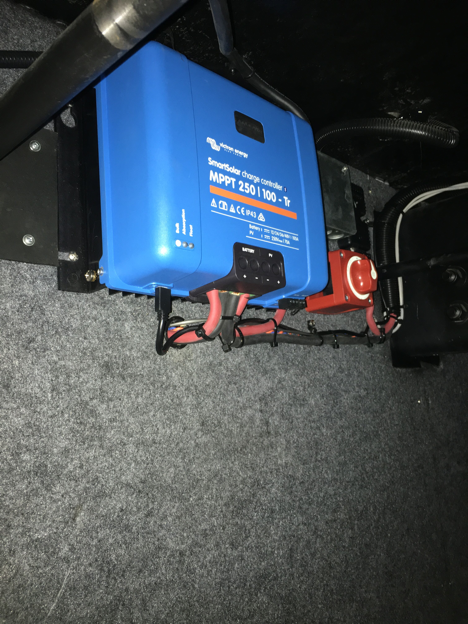 We also installed a Victron 150/100 charge controller with built-in Bluetooth capability, a Victron BMV-702 battery monitor, and a VE.Direct Bluetooth Smart Dongle so they can easily and accurately monitor their battery bank’s state of charge. 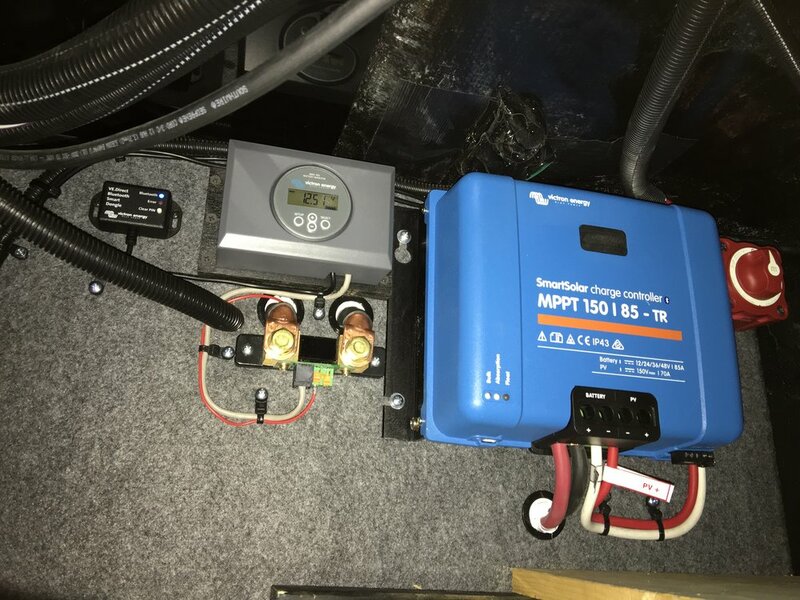 This client was already familiar with BlueSky solar products, so he chose to go with a BlueSky 3024iL charge controller. 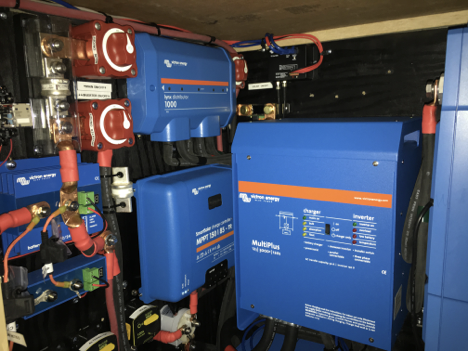 Along with the BlueSky charge controller we installed a 2000VA Victron Inverter kit, and a 300Ah AGM battery bank to complete the system. 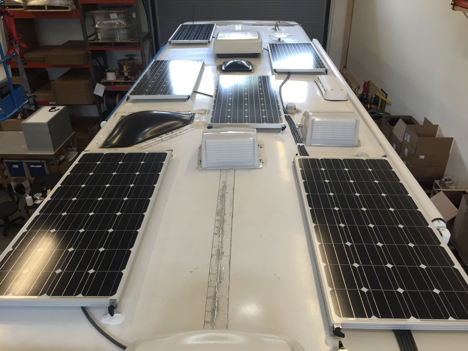 The mid-sized solar power kits provide enough power to keep his batteries healthy, and run some electronic devices when disconnected from shore power. This client originally requested to have three SF180 Solar Power Kits installed, along with a 40A charge controller. After about a month he realized that he didn’t have enough solar power to meet his needs and he came back to upgrade his system. 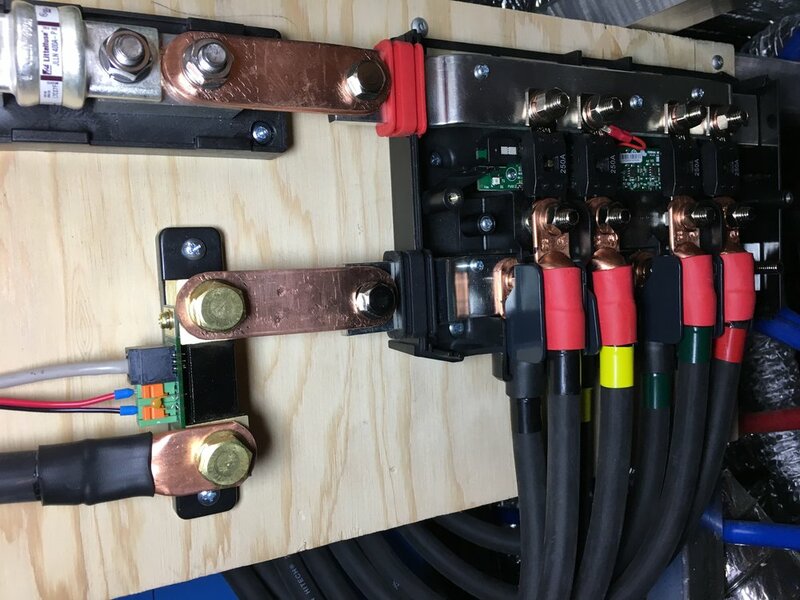 We added three more SF180 Solar Panel Kits, and replaced the 40A charge controller with an 85A Victron charge controller to accommodate the additional solar charging current. We always recommend that our clients have us install a system that is easily expandable to avoid duplicate costs. It is much more cost effective to install a larger system core that allows for expansion than it is to install a smaller system core that has to be completely replaced in order to add additional power. We like to install our systems as cleanly, and as easy to manage as possible. 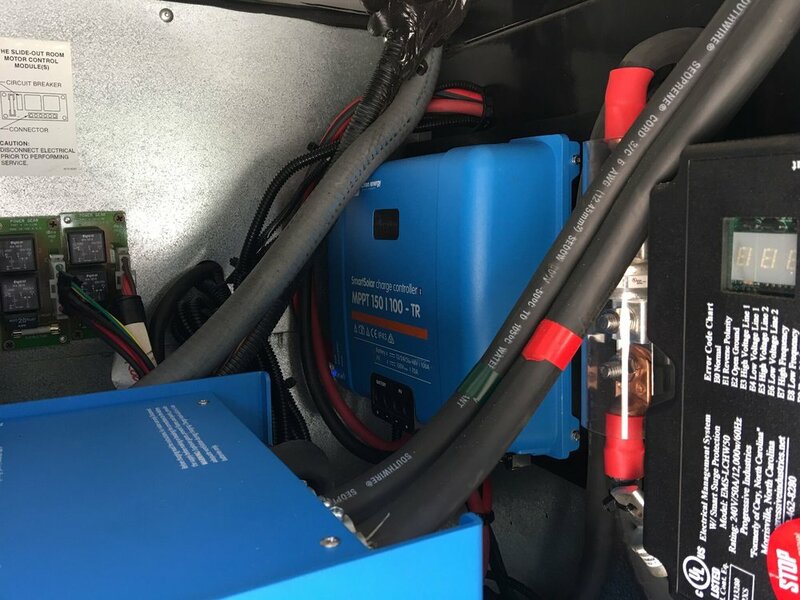 These clients came to us with an existing battery bank wired by the manufacturer that worked well enough, but wasn’t quite as clean or as orderly as we would prefer. 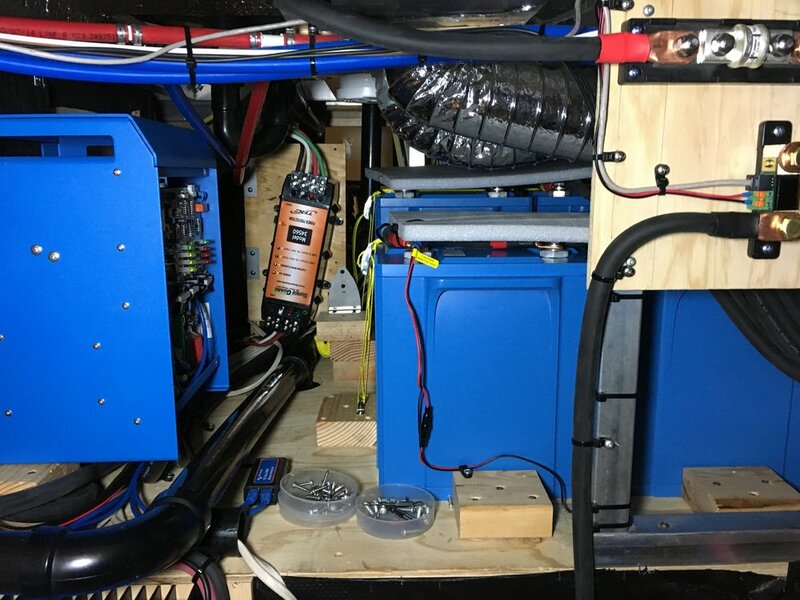 During the process of installing their new battery monitor we cleaned up the battery bank and decluttered some of the wiring to create a more efficient battery bank. We also installed 1440 Watts of solar power which will go a long way towards offsetting the power used by their residential fridge. 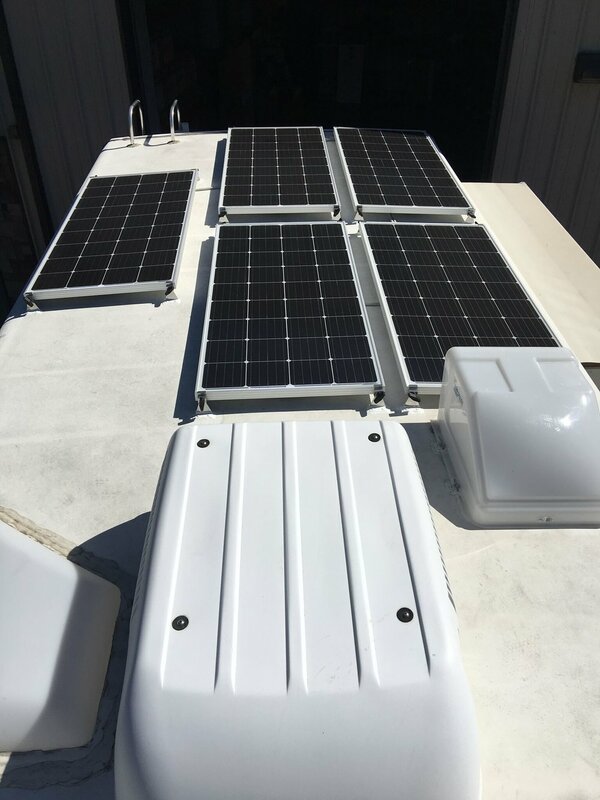 Our combiner box (C-Box) is custom made by AM Solar for efficiently combining solar panel output cables and sealing off a roof penetration. It’s rugged and spacious design make installation and troubleshooting very easy. It is the most efficient way to install a lot of solar with only a single penetrating hole through the roof. It has eight possible ports and can use up to 2-gauge cable, which allows for installation of larger solar arrays. We have installed as many as 16 solar panels (1600W) onto one roof using just one C-box (in 8 series pairs). It has a very small footprint for its available capacity, and it is sealed to ensure that it is completely waterproof. This client asked us to install as much solar power as we could fit onto their roof. We installed ten 160W solar panels providing a total of 1600 Watts of solar power. This amount of solar power is an excellent match for their 800Ah lithium battery bank and will allow them to run their outlets, residential refrigerator, microwave, washer and dryer, dishwasher, fireplace, and their air conditioner without running their generator. 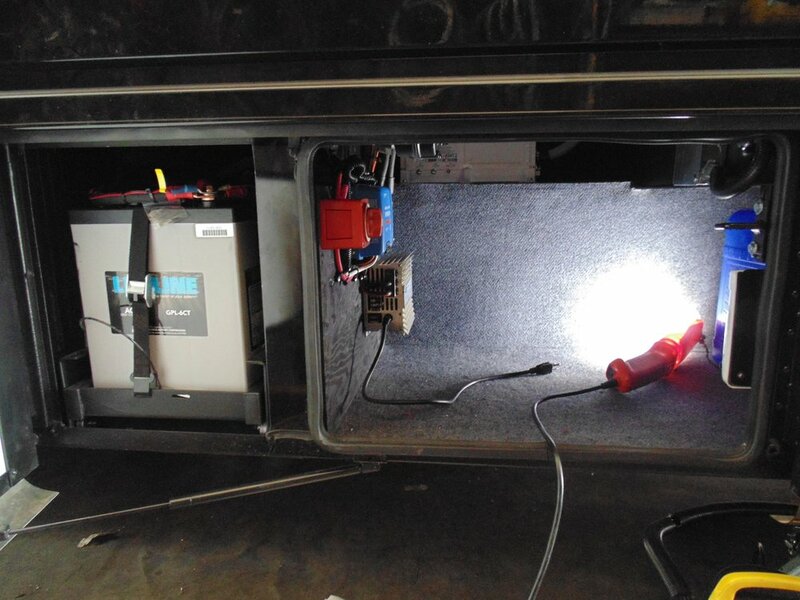 This client’s RV was pre-wired by the manufacturer with 6-gauge cables, and an inverter. 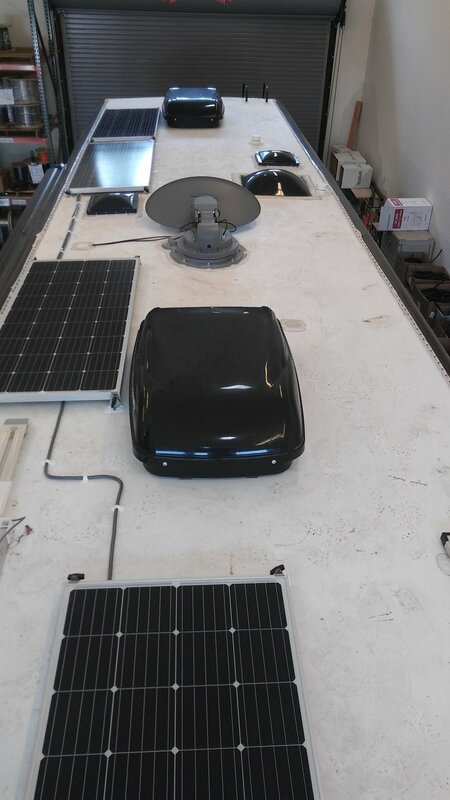 We installed 960 watts of solar power, which is more than we would recommend for 6-gauge cable, so we had to take additional steps in order to make the system as efficient as possible. With these under-sized cables, voltage would have been lost between the solar panels and the charge controller. We installed the solar panels using series/parallel connections to increase the voltage, reducing the amount of voltage drop to less than 1%, which resulted in increased system performance. This client will be able to run their residential refrigerator without using a generator or shore power. 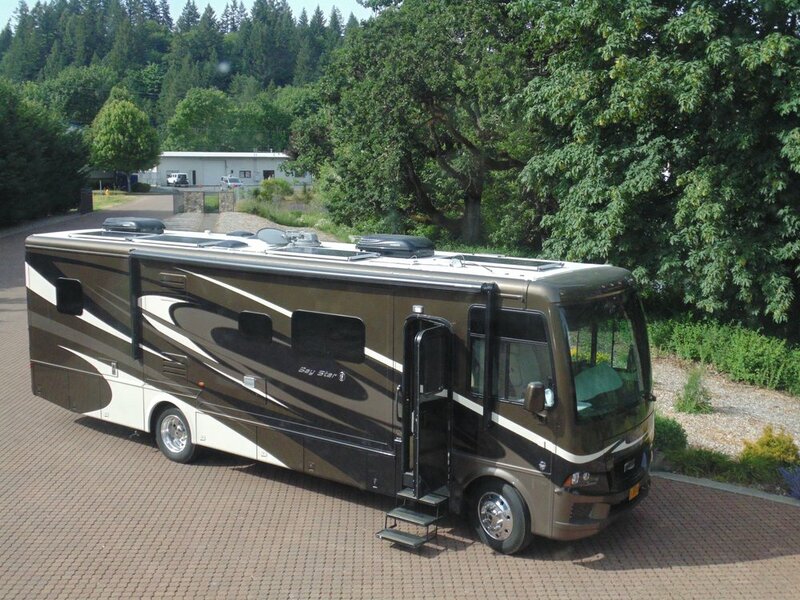 These clients decided to give up their traditional lifestyle, sold most of their belongings, and moved full time into their RV. They also work out of their RV now. 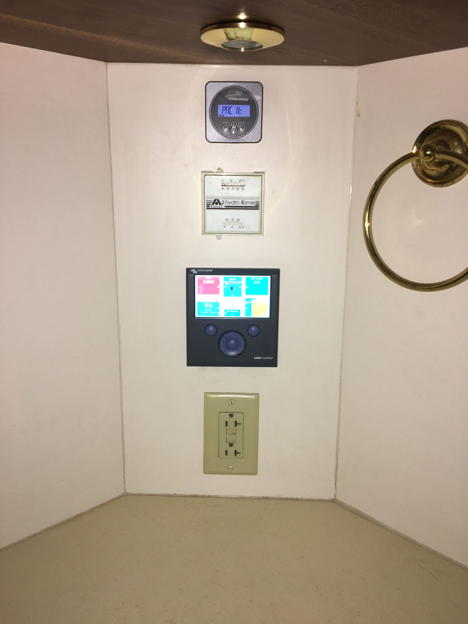 We installed 1280 watts of solar power, which allows them to run their air conditioner, washer and dryer, microwave, and anything else they plug into their outlets without being powered by a generator or shore power (for a short period of time). They put as many solar panels on their roof as possible in order to maximize their solar power, and reduced their need to run a generator or connect to shore power. 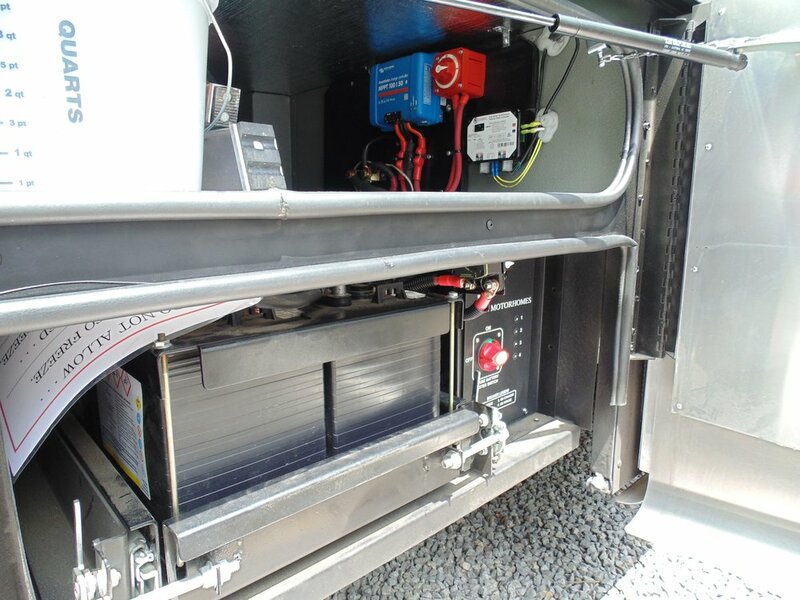 A powerful 960W solar charging system with an 800Ah AGM battery bank and battery monitor give this motorhome energy independence. When parked for long periods, three of the 160W solar panels can be tilted toward the south to maximize solar production. 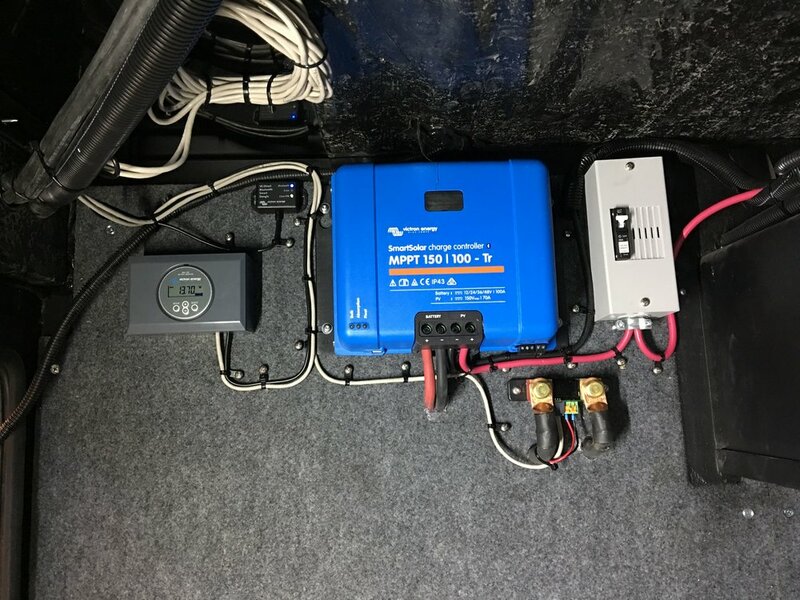 The Magnum BMK (Battery Monitor Kit) uses a shunt to measure current and communicates battery status to the existing ME-RC50 inverter/charger monitor. The Victron charge controller in the system core conveys solar charging status to a smart phone. Unless these clients need to run their air conditioner for several hours, they won’t have to worry about plugging into shore power. 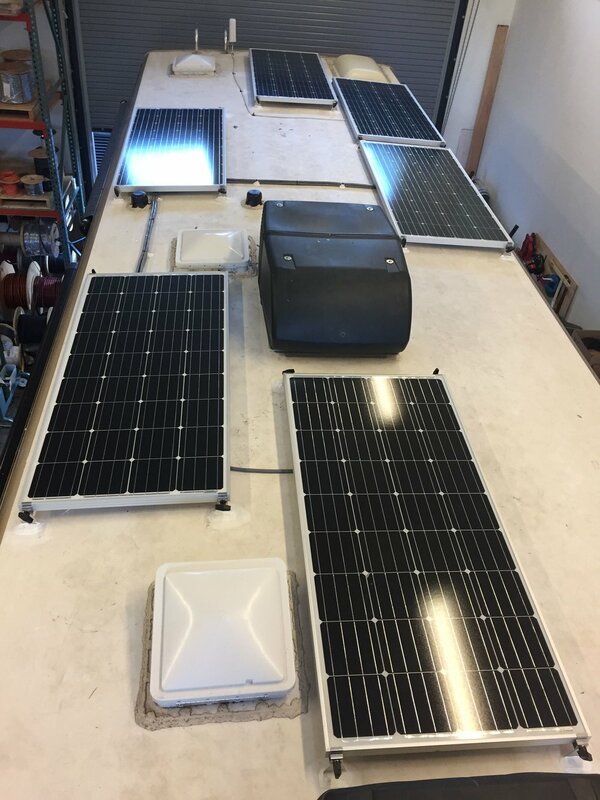 With a 640W solar charging system, this client can now run a residential refrigerator, lights and some TV usage from energy captured by the solar panels. 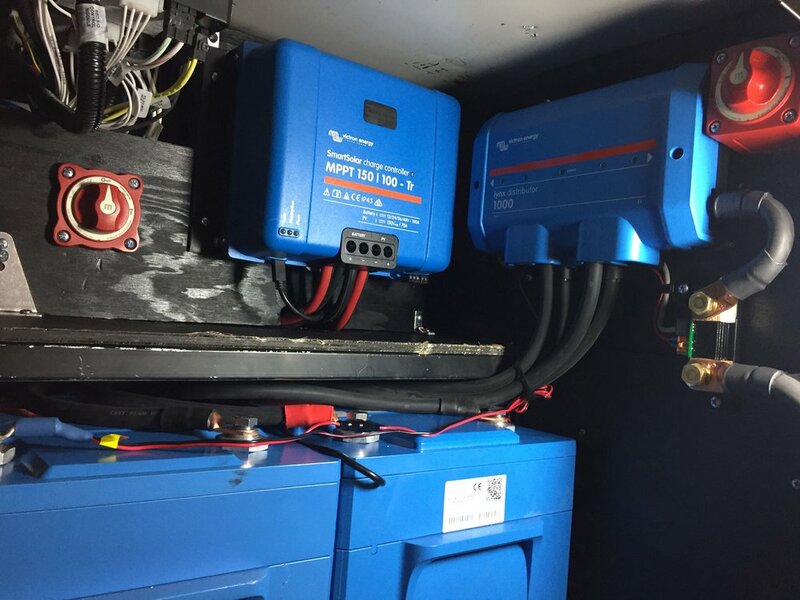 As a part of the system core that we regularly install, the client will also be able to monitor their battery bank and determine remaining charge to the Amp-hour. We recommend four 160W solar panels when running a residential refrigerator, but sometimes you can get away with three if you aren’t running many other loads and you camp in sunny areas. 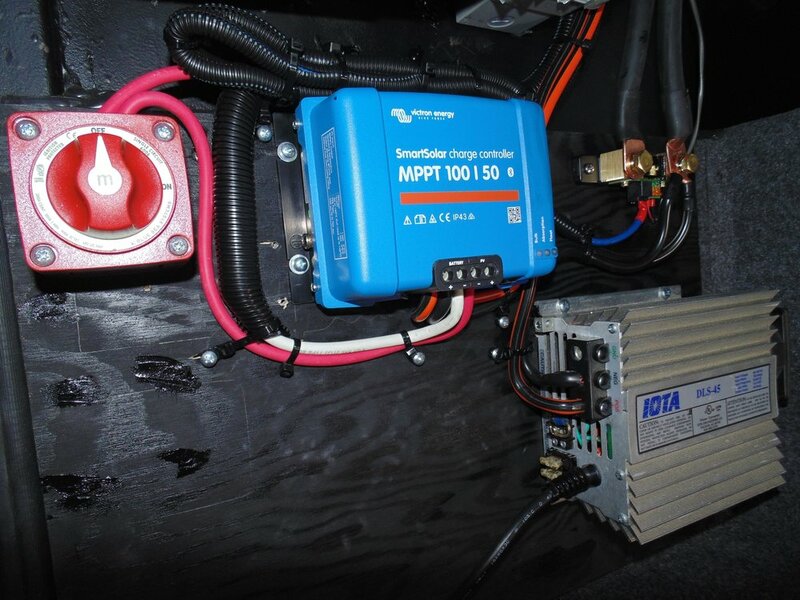 With the Magnum hybrid inverter, this client can draw power from shore power and the battery bank at the same time. This makes a lot of sense when connected to a 15A source and you want to run large loads like air conditioners. This client got a 640W Solar charging system with a 2000W inverter/charger. A system like this is capable of running a residential refrigerator, microwave and blender. 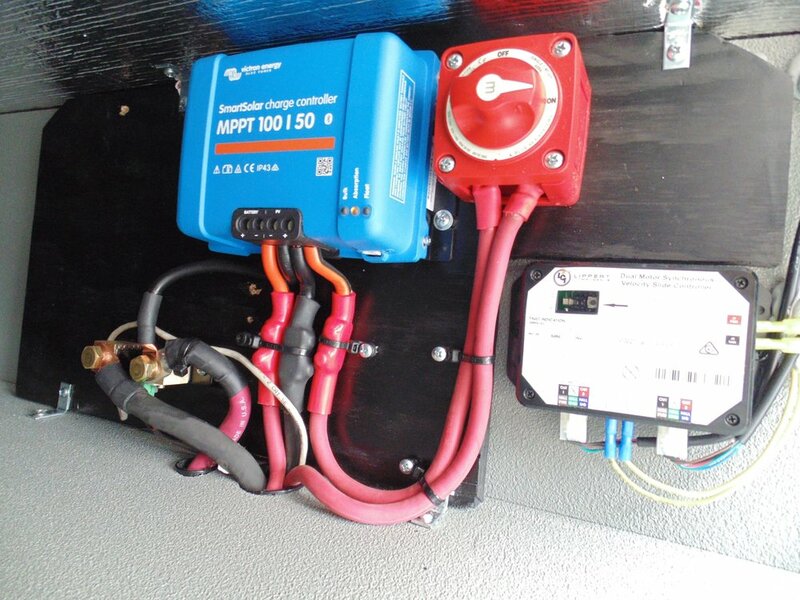 Because a 70A charge controller was used, this system can be expanded in the future with the addition of two more 160W solar panels. 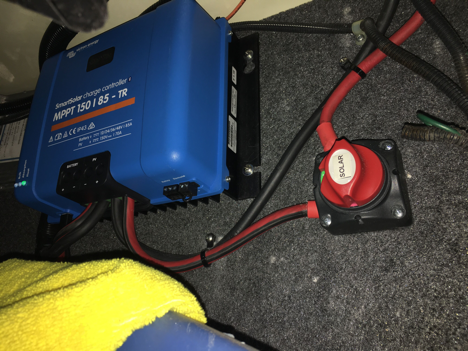 This client now enjoys the latest Bluetooth monitoring technology with their 800W solar charger and 640Ah AGM battery bank. Charging current, battery voltage, remaining battery capacity and battery temperature can all be read through the Victron Connect app on a smart phone.